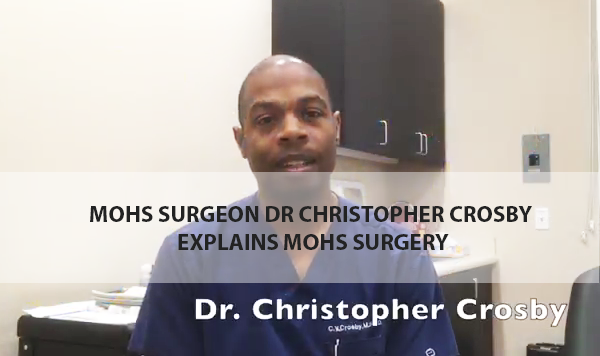 Board-certified dermatologist, Dr. Christopher Crosby is Fellowship-trained in Mohs surgery for skin cancer. San Diego, CA residents trust specialized surgeons like Dr. Crosby for skin cancer treatment with a high success rate and minimal scarring. Mohs micrographic surgery is a specialized technique for removal of common basal cell carcinomas, squamous cell carcinomas, and some melanomas. The precise procedure is done in stages, while the patient waits. A thin layer of the lesion is removed, dye-mapped, and examined under high magnification with careful attention to tumor margins. The procedure is repeated until no cancerous cells remain. Highest cure rate – up to 99 percent for first time lesions; 94 percent for recurring cancers. Minimal destruction of healthy tissues for faster healing and reduced scarring. No stress of waiting for lab results. By the age of 70, one in every five people in this country will develop skin cancer, and every hour one person dies from melanoma. However, the prognosis is very good with early detection and effective treatment. Dr. Crosby and his team at Coastal Skin & Eye Institute in San Diego, CA urge you to schedule an annual skin cancer screening. Mohs micrographic surgery is a specialized, highly effective technique for the removal of skin cancer. The procedure was developed in the 19 by Dr. Frederic Mohs at the University of Wisconsin and is now practiced throughout the world. Mohs surgery differs from other skin cancer treatments in that it permits the immediate and complete microscopic examination of the removed cancerous tissue, so that all “roots” and extensions of the cancer can be eliminated. Due to the methodical manner in which tissue is removed and examined, Mohs surgery has been recognized as the skin cancer treatment with the highest reported cure rate.